Urgent discoveries to be made? This glow-in-the-dark T-shirt is on hand to help. Its brighter-than-bright design means mini dinosaur hunters and helicopter pilots can get straight to work whatever the time of day. In pure cotton, it’s machine washable – ideal after any evening escapades. Intricate embroidered motifs take the cool factor up to 11 on this cotton colourblock T-shirt. With bright blasts of neon thrown in, it's bound to be the next hero on the playground. Who likes surprises? Check out the flaps on this T-shirt. 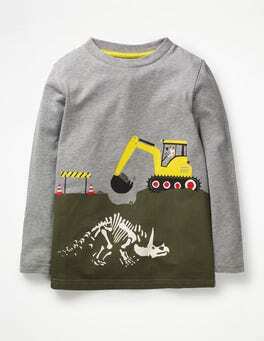 The French bulldog, dinosaur and digger appliqués can't fail to entertain. 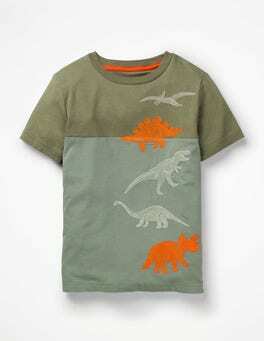 Our supersoft 100% cotton fabric is kind to delicate skin, while poppers make for easy dressing.